It’s been…oh… about three years since I last took a floral design class. Somewhere in one of my previous posts I said I would make moves to become a floral designer and well, here I am. 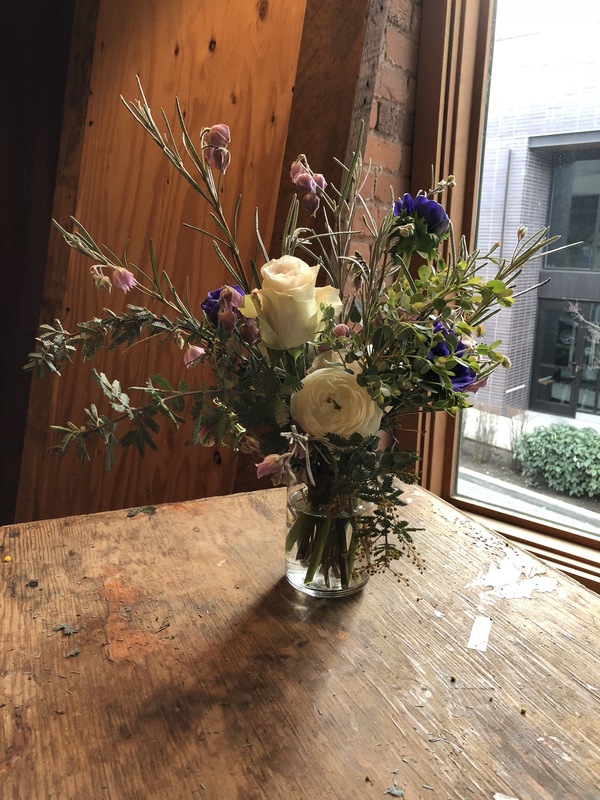 One of my best friends tagged me in an Instagram post – it was for a floral design class taught by Kristen of Wild Bloom Florals in Seattle and held at Glasswing. Personally, I’ve never stepped foot in Glasswing until this workshop. From what I saw, it was a cute boutique shop with clothing, jewelry, fresh cut flowers and house plants that adorned the store. There were about seven or eight students in the class – all with beginner knowledge of floral design. It was refreshing to meet individuals who are looking to become floral designers themselves or have some sort of interest in floral design. I didn’t get a chance to speak in depth with anyone because I mainly shied away and was quiet as I normally am in a new environment. The instructor noticed my quiet demeanor and called me a ‘quiet warrior’ as I plugged along in the workshop. I listened quietly and every so often had questions regarding the look of my piece. There were a couple tricks I learned and some tips I already had under my belt. At the end I was able to take a lovely vase filled with the centerpiece I created. It was refreshing to hear that this was the third person I had heard from who had quit their 9 to 5 job to pursue floral design. I mean ding ding ding, this is all the motivation I needed. A lot of advice I’ve been getting is to keep practicing techniques, keep offering my services at a volunteer at a design studio or freelance. I’m going to keep chugging along. Taking any and all classes as is financially possible.